At Pleasant Valley Conservancy we have dealt with weeds in our prairie remnants, our restored oak savannas, and in the prairies we have planted in former agricultural fields. Each situation presented different problems and required different solutions. I admit I was surprised when Paul West told us in the summer of 1997 that hand-weeding would have to be done on the South Slope. All we had done so far was cleared and burned Kathie’s Prairie. How could there be weeds already? Not woody plants, but herbaceous ones. Weeds he specifically mentioned were wild parsnip and sweet clover. Later, mullein and thistle entered the picture. Obviously, our restoration work had not created these weeds. They had already been there. So it was not only woody vegetation that we would have to deal with. I finally got accustomed to the idea that weeding was one of the major activities of restoration ecology. And in natural areas, weeding was often hand work, although weeds could sometimes be dealt with by mowing or spraying. Paul West spent 6.5 hours pulling primarily wild parsnip on Kathie’s Prairie in July 1997. In July 1998 he and Pat Schrader spent 16 hours. Again, mostly wild parsnip. In 1999 the hired crew pulled no weeds as this was the year the whole South Slope was cleared, and burned, but Kathie did a lot of weeding (see below). But in the year 2000, West, Schrader, Michler, Brown, and Nate Chisholm among them worked almost 1000 hours pulling weeds, almost all on the South Slope! Although most of the weeding in 2000 was on the South Slope, weeding was also done on the County F and Pleasant Valley Road cuts. Also at a scrubby area at the corner of PV Road and County F (Unit 14), and Toby’s Prairie (quite a bit, as this was in its second growing season). In the early years, all the weeds were pulled by hand. This requires a strong back and strong arms and shoulders. Most of the folks pulling weeds at PVC were young and strong, and seemed to have no trouble. However, as the weeds age their root systems get larger, and eventually they get to the stage where they really can not be pulled. A strong person will end up just breaking the stem near the base. This is when you start thinking about a shovel. Aug 3, 99. K to farm. Willis here too…Most of sweet clover and parsnips now removed from whole area and Willis is pulling Q Anne's lace. Kathie and I first got involved in invasive plants through our work at the Campus Natural Areas on garlic mustard. In fact, garlic mustard became a major issue for us for a while. Kathie discovered major infestations of garlic mustard in Shorewood Hills, and got a number of village residents involved. She got the Village Board to declare garlic mustard an official “noxious weed”, which led to lots of work in the village. Kathie organized volunteer work parties to control garlic mustard on village land, and she and I did lots of garlic mustard work on our own. Then there was the very important meeting called “Plants Out of Place” (acronym POOP), held in March 2001 at Eau Claire. This meeting was held in association with meetings of The Wild Ones (the day before POOP) and The Prairie Enthusiasts (the day after POOP). With all these meetings, attendance at POOP was over 600. Kathie and I attended both the POOP meeting and the TPE meeting. I really revel in this sort of high-level meeting that provides a great summary of expert scientific information. In addition to the meetings, there was an extended discussion among the presenters and attendees of how control of invasive plants could best be accomplished. This was one of those sessions where people wrote topics on large sheets of white paper hanging around the sides of the room. One of the major “conclusions” was that a new organization was needed that dealt with invasive plants of Wisconsin. All those interested in this idea were invited to attend an evening meeting to formalize this organization. Kathie and I attended this meeting. TNC’s Nancy Braker, who Kathie had worked with extensively, was the secretary of the meeting. I ended up sitting in the middle of the table, which led me to do a fair bit of talking. When it came time to select officers for the new group, I was asked to be President. Since Kathie and I were so heavily involved in our own restoration work, I declined, but volunteered to be Treasurer. Before the end of the evening, it was decided to call the organization the “Invasive Plants of Wisconsin” (IPAW). In order to incorporate we needed Articles of Incorporation, which were written that evening. The By-laws, needed to get non-profit status, were written later by the Board of Directors. As Treasurer, my responsibility was to get the organization started. I took all the checks that had been written by potential members and on return to Madison made the application to incorporate with the Wisconsin Department of Financial Institutions. The fee to incorporate came from my personal checking account. IPAW was officially incorporated on March 8, 2001, just a week after POOP was over. Once I had the official name, I got a tax ID number from the IRS, started a checking account, and deposited all the checks. With a bank balance, I was now able to write checks. I rented a post office box at the Hilldale Station (Box 5274, which still exists). I checked the P.O. box for mail weekly, and was pleased to see checks coming in. The membership list was being maintained by the Executive Director of The Wild Ones, so as checks came in, I deposited them and sent the names and addresses on to her. I wrote a thank you note to every new member. With the Board of Director’s help I put together the papers necessary for becoming a non-profit organization and sent them off to the IRS. In due course, the letter came back making us a 501-(c) 3 corporation. The other activity I played a major role was getting a good web site for IPAW. One of the new members, Marsha Vomastic, had volunteered to set up the web site. She was an experienced web designer and she and I worked together. I wrote quite a bit of the website content. Although the design has now been updated, Marsha’s web site served IPAW well for many years. Because I was so intimately involved in the creation of IPAW, I quickly became very familiar with the biology and control of Wisconsin’s invasive plants. With my strong scientific background it was no problem reading the scientific literature in this field. And we had our own Conservancy as a test case for control methods! Here it is 17 years later and weeding is still necessary, although lots less than in 1998. Kathie and I became stewards of this fine prairie remnant in 2001. By that time we were beginning to understand sweet clover fairly well, and BE was heavily infested. In those early years, the patches were very large, and had to be mowed. Sometime around 2009 or 2010 mowing was no longer necessary, but hand pulling is still essential. Although volunteer work parties are held regularly, the fact is that most sweet clover work at BE is done by hired help, although for about 10 years we also used paid interns. At one time I thought we might be able to eradicate sweet clover from BE, but I no longer believe this. However, some years it is worse than others. This year is especially bad. Why is sweet clover so bad at BE when the prairie itself is so good? 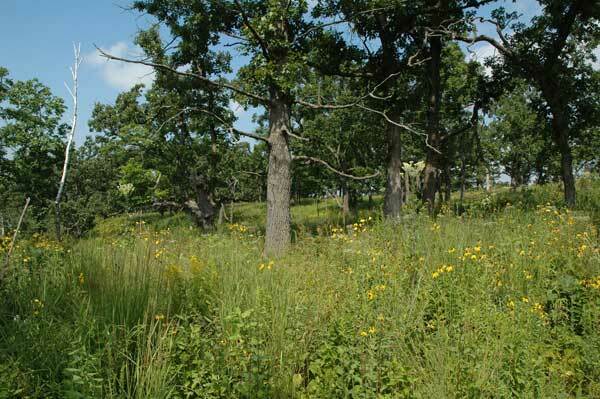 After the Nature Conservancy acquired BE Prairie, considerable effort was put into sweet clover control, but as the years went by, work focused more on brush control. In the year 2000 only 7 hours were spent on sweet clover control. If sweet clover is not eradicated, seed formation will occur, adding to the already rich seed bank. 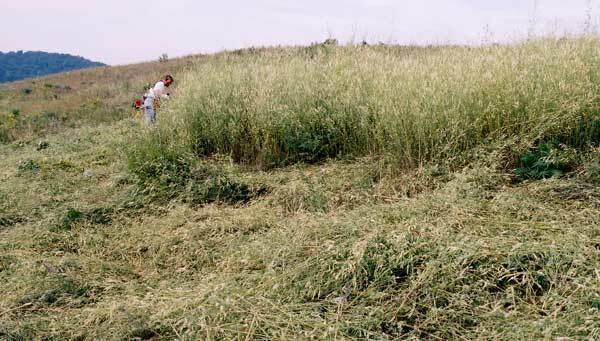 The main reason Kathie and I took over stewardship in 2001 was because we were concerned about the sweet clover problem at Rettenmund Prairie.